We offer “AT HOME” teeth whitening at the practice. This involves taking an impression and sending it to the laboratory for a custom made mould that fits your mouth exactly. This is important to avoid any leaks when using the whitening gel which can cause gum sensitivity. We provide you with the kit which contains the whitening gel and demonstrate to you how the whitening should be done. You will also be advised that certain teeth, eg. 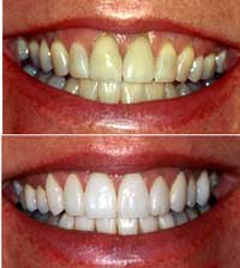 crowns or veneers will not become lighter with this treatment but will retain their original shade. This can also apply to certain stains on your teeth. We use a kit which has over the last decade proven to give good results if used properly. We occasionally have offers which can be e-mailed to you or will be posted here.